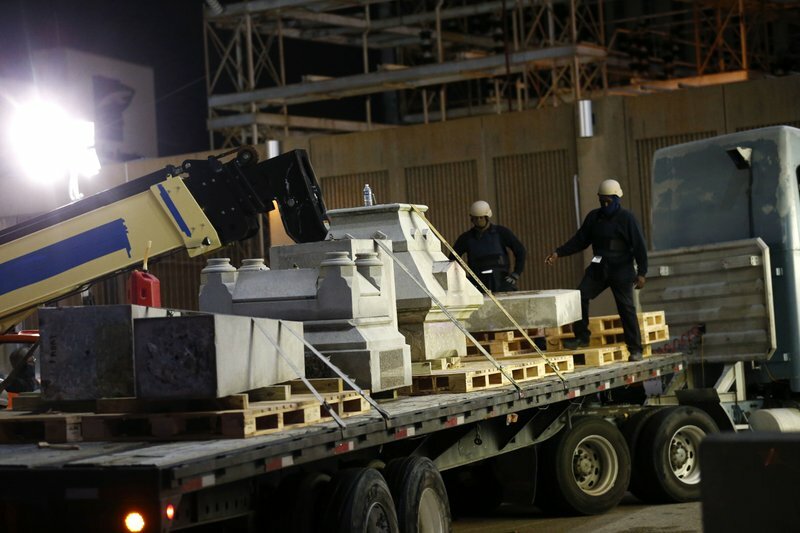 A monument to a deadly white-supremacist uprising in 1874 was removed under cover of darkness by workers in masks and bulletproof vests Monday as New Orleans joined the movement to take down symbols of the Confederacy and the Jim Crow South. 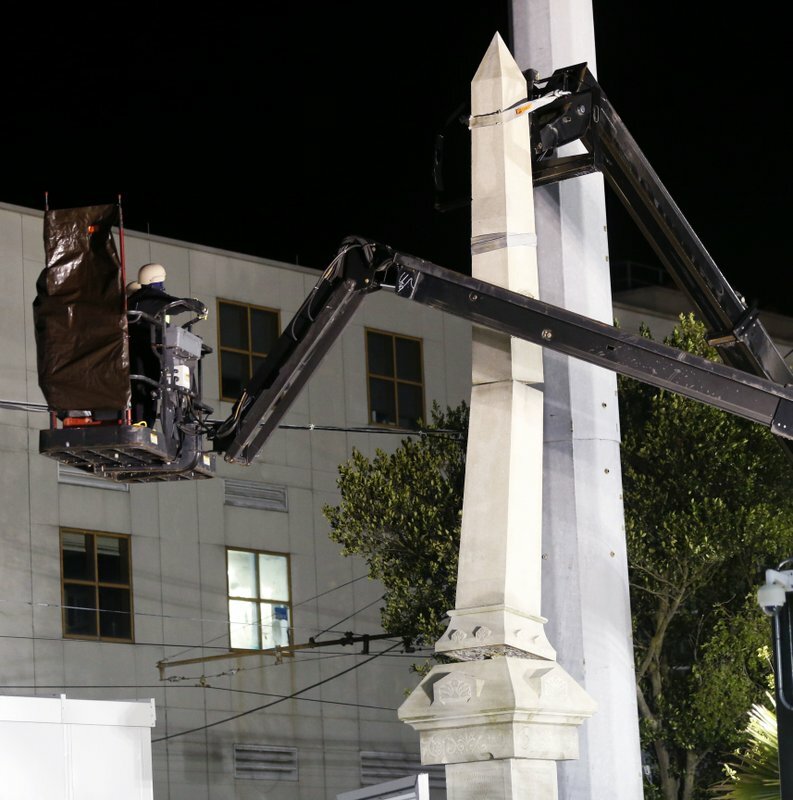 The Liberty Place monument, a 35-foot granite obelisk that pays tribute to whites who tried to topple a biracial Reconstruction government installed in New Orleans after the Civil War, was taken away on a truck in pieces before daybreak after a few hours of work. In the coming days, the city will also remove three statues of Confederate Gens. Robert E. Lee and P.G.T. Beauregard and Confederate President Jefferson Davis, now that legal challenges have been overcome. The removal of the obelisk was carried out early in the morning because of death threats and fears of disruption from supporters of the monuments. The workers wore military-style helmets and had scarves over their faces. Police were on hand, with officers watching from atop a hotel parking garage. Citing safety concerns, the mayor would not disclose exactly when the other monuments would be taken down, except to say that it will be done at night to avoid trouble. He said the monuments will be put in storage until an appropriate place to display them is determined. Nationally, the debate over Confederate symbols has flared since nine black parishioners were shot to death by an avowed racist at a church in Charleston, South Carolina, in 2015. South Carolina removed the Confederate flag from its statehouse grounds in the weeks after, and several Southern cities have since considered removing monuments. The University of Mississippi took down its state flag because it includes the Confederate emblem. 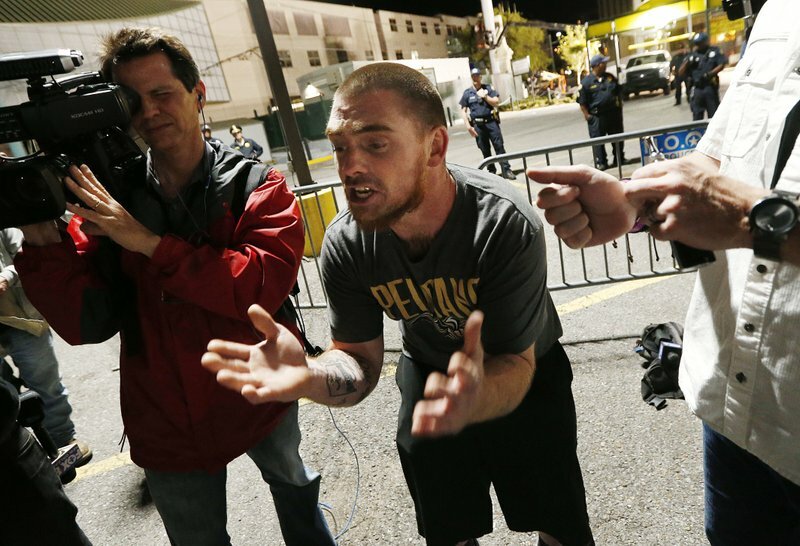 New Orleans is a mostly black city of nearly 390,000. The majority-black City Council voted 6-1 in 2015 to take the monuments down, but legal battles held up action. Landrieu, a white Democrat, proposed the monuments’ removal and rode to victory twice with overwhelming support from the city’s black residents. Opponents of the memorials say they are offensive artifacts honoring the region’s racist past. Others say the monuments are part of history and should be preserved. Robert Bonner, a 63-year-old Civil War re-enactor, was there to protest the monument’s removal. The Liberty Place monument was erected in 1891 to commemorate the failed uprising by the Crescent City White League. Sixteen White Leaguers, 13 members of the white and black Metropolitan police force and six bystanders were among those killed in the bloody battle down Canal Street. President Ulysses Grant sent federal troops to take the city back three days later. However, the White League grew in power in New Orleans after the battle, with its members and allies taking over the city and state government after Reconstruction. New Orleans removed the memorial from busy Canal Street during a paving project in 1989 and didn’t put it back up until the city was sued. Even then, it was consigned to an obscure spot on a side street. Landrieu said the memorials don’t represent his city as it approaches its 300th anniversary next year.